So… yeah, sleepers aren’t exactly clothes. 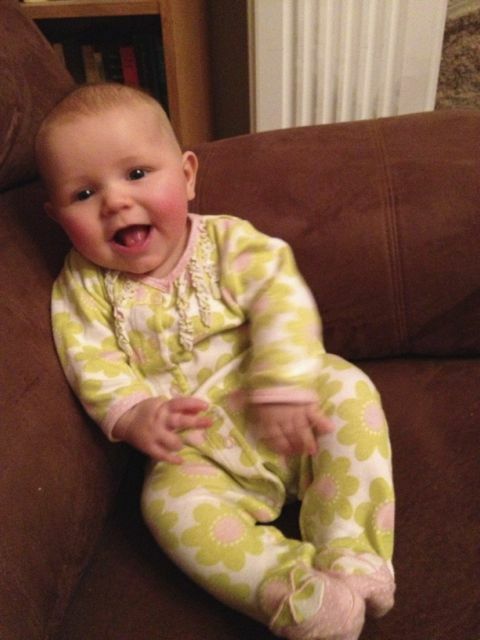 But if anyone can get away with wearing pajamas for daytime fashion, it’s babies. 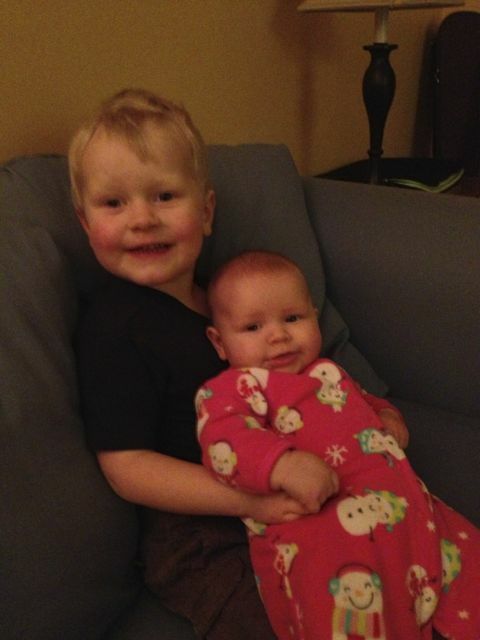 And again – they’re too cute not to be documented. Something about babies inspires clothing designers to CUPCAKES. I guess ‘cuz they’re small and yummy. Christmas gift from her Grand Aunties – please note the ballet-slipper feet. OH. EM. GEE. 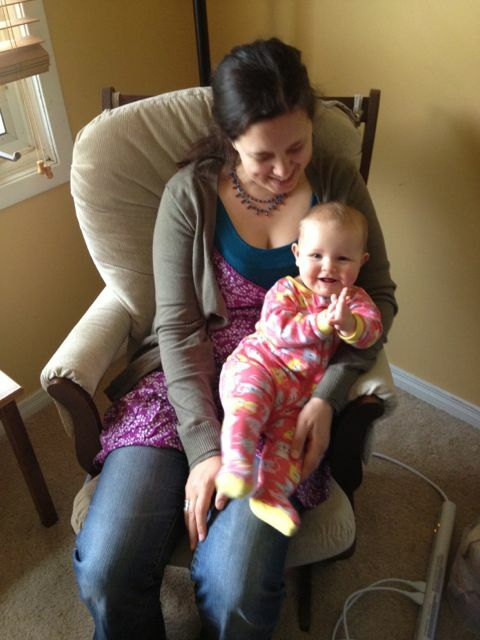 This sleeper is fleece – and I gotta say, fleece is fleecier now than it was when we were kids. SO soft. This was a gift from faraway friends that arrived at the perfect time: it fit AND it was cold weather. This was a fave before she outgrew it – I love purple and I love stripes. It didn’t occur to me that she looked like a wee convict until Auntie Em said so. ← I can hardly wait to be perfect. Naomi had the same cupcake sleeper! 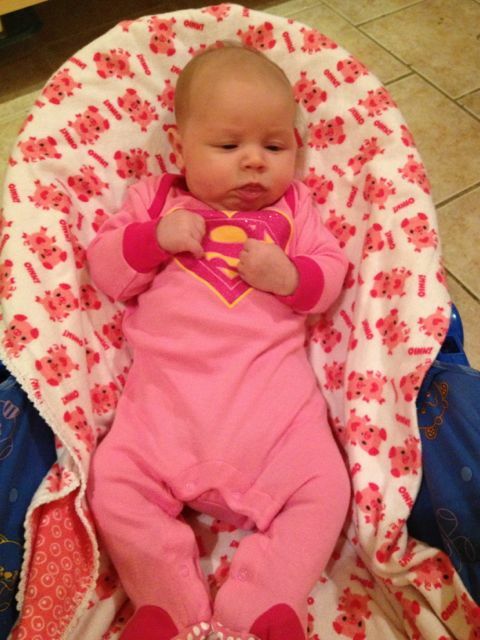 She looks so cute in her Supergirl jammies. In retrospect I should’ve included some sort of accessory…a mask? A bitty baby whip? So glad you’re enjoying this simple pleasure of having a girl. I’m all for putting kids in whatever clothes, but you gotta admit the girl clothes are SO much more fun! Yep, there's no question the girl clothes blow the boy clothes outta the water. 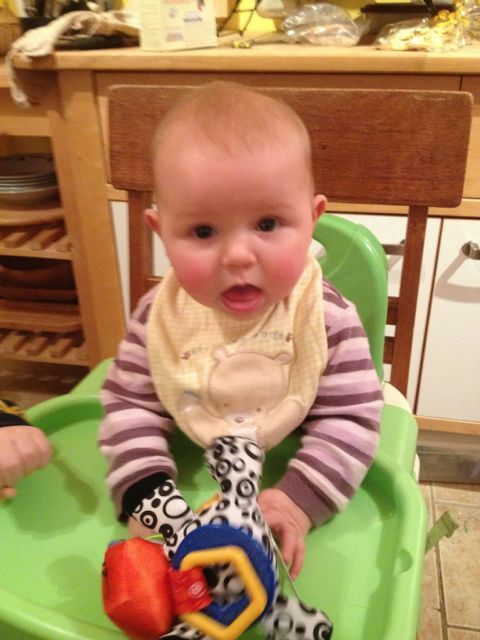 And I am loving having a girl - although she's not as "simple" a baby as her brother was! 🙂 Wouldn't trade her for anything of course. 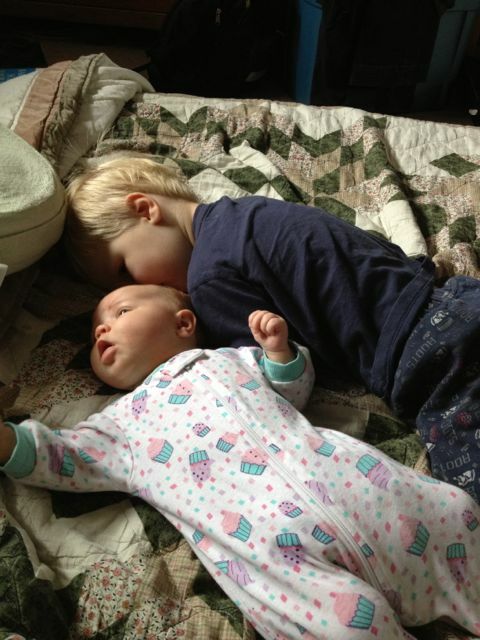 oh, man, the polka dot feet on the Superbabe sleeper are my favourite!!!!!!!!!!!!!!!!!!!!! Yes! Those are little grippy dots – even though no baby that size walks, I’m pretty sure. Presh, as always! But wait! Just wait till you see her in her wedding gown in a few years. You’ll be blown away!!! Oh! Sniff!! I CANNOT WAIT TO SEE QUINNY’S DRESS. Auntie CL is one of the grandaunties. She, too, is delightsome – but Baby Aby really takes the cupcake at this point! She IS delightsome. And she has great taste in baby clothes. but they are BIG grippy dots! OMG, how cute are these pictures?! I am dying of all the adorableness created by the supergirl sleeper. DYING. Larks (@LarksNotesThis) recently posted..Preschool graduation. Right?? I wish I designed baby clothes for a living.